Large moving Victorinox knives display unit - produced in Switzerland in the second half of the 20th century (limited edition) model e83. 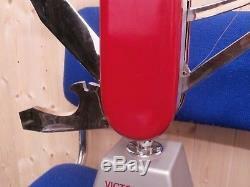 The item in its original, very good condition - working with 5 moving blades. 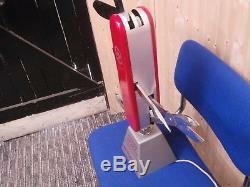 Fully working - measures 23 inches tall (34 inches with knife blade) x 12 wide. Cutting blades run when connected to the power supply. Quietly working mechanism that moves the blade. 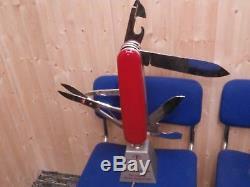 The blades are made of thick plastic, and the casing is made of plastic and metal. 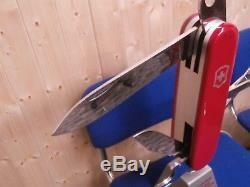 Electric Advertising Automaton for'Victorinox' Swiss Army Knives. These 20th century shop window display automata were made to advertise the world famous knives, and were distributed to shops in Europe and North America in the 1950s. 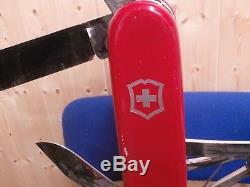 Was made in very limited quantities, and only made available to a select group of Victorinox dealers. This item is quite rare and due to its high decorative value will be quite sought-after by collectors. The moving display includes the following implements, all in oversize metal-coated plastic. Please see photos for very slight surface slight damaged areas. 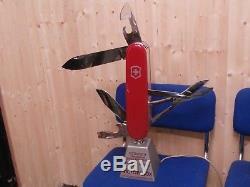 The item "RARE ELECTRIC VICTORINOX SWISS ARMY SHOP DISPLAY KNIFE MOVING MOTORIZED" is in sale since Tuesday, September 4, 2018. 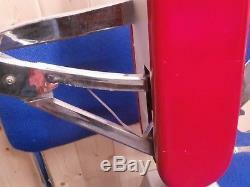 This item is in the category "Collectables\Advertising Collectables\Other Advertising Collectables". 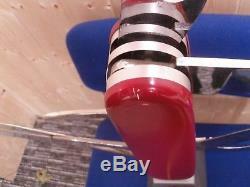 The seller is "butteneedog" and is located in melksham. This item can be shipped worldwide.